Some employers request that jobseekers submit physical copies of application materials, including a printed resume. It is important to make sure any resume template you work from will look just as good printed as it does on your screen. When you select one of our printable resume templates, you can guarantee that the printed document will look crisp and clean. Screen resolution usually ranges from 72 to 100 pixels per inch. Print resolution should be around 300 dots per inch to achieve a professional look. Resolution can affect the appearance of both text and graphics in a printed resume. You should definitely make sure that any graphical layouts you consider are available in a suitable resolution for print if your hiring manager requests a physical copy. Read on to learn how print-ready templates can make the job application process easier. 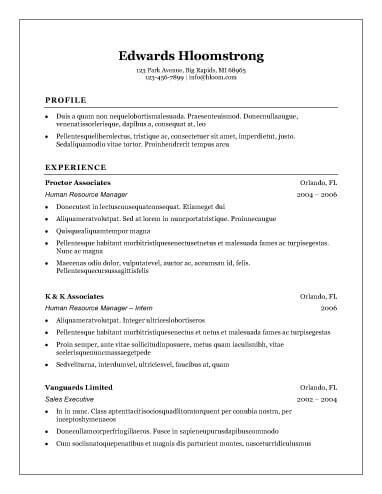 Why Use Printable Resume Templates? Here are a few styles of printable resume templates that you might want to consider. Entry-level applicants who need printable resume templates can find basic entry-level resume designs and functional resumes that emphasize skills over work history. There are a number of options available for early career jobseekers or those who have recently changed careers. Generally speaking, it is a good idea for entry-level candidates to keep their resumes simple and straightforward. Professionals with more experience in their field may have more information to provide on a resume than candidates earlier in their careers. Our professional resume templates have enough room for you to display all of your skills and go into sufficient detail about past occupations. We also offer a number of polished printable resume templates to choose from. Designs and graphics that look great on the screen may not translate to the printed page. One of the best ways to ensure your printed resume looks great is to use one of our clean printable resume templates. These templates are free of distracting formatting and should be easy for a hiring manager or recruiter to quickly read or refer to during an interview. Employers like our popular resume designs for a reason. Browse through our top designs to find a stylish and up-to-date layout that looks great on and off of the screen. Make sure that the template you choose is suitable for the type of position you are seeking, and factor in your need to print the finished document. If you don’t want to worry about whether the resume style you choose will make a good impression, you can count on our tried-and-true resume templates. A number of these designs function as printable resume templates. You might want to consider printing off a template to see what it looks like on paper before you fill in all of your information. Each section of a resume contains fairly standardized content. It is a good idea to consider including the following information in your document, regardless of the template you choose. Full name: Put your full name at the top of your resume. Phone number: Give a phone number at which an employer can reliably reach you, ideally a personal cell number or home number. Mailing address: Include at least your current city and state of residence. You can also provide your street or mailing address. Professional email: Make sure your email address is suitable for work and that you check it regularly. Social Media: Depending on the position, you might want to add links or usernames to professional profiles. If you are using one of our printable resume templates, you should keep in mind that a reader will not be able to click on a link. Summary Statement: A summary statement is a great way to cover your skills and what you can bring to a position near the top of your resume. Using keywords from the job description can be a great way to keep a potential employer reading your resume. Objective Statement: An objective statement addresses your goal in seeking employment. This statement may focus more on what you want from an employer or what you desire in terms of your career path rather than what you have to offer in terms of a specific position. Determine: Make a list of the skills you think you can bring to the position. Double Check: Read over the job description and identify key language. Determine whether you can describe any of your original skills in these terms. List: Prioritize your list of skills based on the employer’s priorities and your own strengths. Structure: Start this section with your present job or most recent occupation. Each entry should go back in time, ideally without large and unexplained gaps. Roles: Give the title of each position, the name and location of the employer, and your dates of employment. Responsibilities: List a few descriptive duties and noteworthy accomplishments under each entry in your work experience section. Academics: Describe any relevant degrees starting with your most recent or highest level of education. You do not have to go back to high school if you have an associate’s, bachelor’s, or other advanced degree. Professional credentials: This section is also a good place to bring up any relevant certifications, licenses, occupational training, or memberships. A resume builder is an even faster and easier way to prepare a resume. This tool allows you to choose from a variety of resume styles, prompts you to provide all of the information necessary to fill out the format you have chosen, and offers additional assistance tailored to the type of job you are seeking. Rather than having to compare printable resume templates and decide which style is right for you, this tool lets you create a resume in five simple steps.